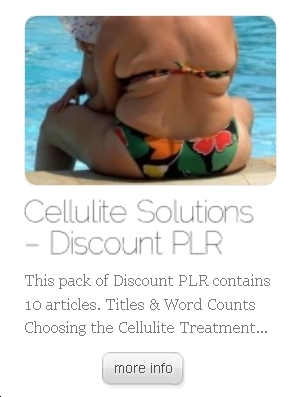 "Solutions for Cellulite" PLR Articles 10 x Pack - On Sale - only $9.50 with a bonus pdf Report! Cellulite is one of those unsightly conditions that many people don't know how to address. Regular exercise does not always help; even though you may lose weight and tone some areas, the cellulite-ridden places may stubbornly refuse to smooth out. Specific exercises, though, may help reduce cellulite's appearance, especially in combination with a healthy diet. Here are some tips and ideas. Not too long ago, we called this kind of exercise "aerobics." Certain cardiovascular exercises work the areas of the body that tend to be prone to cellulite, as well as increase overall metabolism and circulation. Some sources say that cellulite is partially the result of poor circulation; cardiovascular exercises can help this. Some cardiovascular exercises you might try - and some of the areas they target - are listed below.